Alyce has just finished a packed 4th of July. The 4th festivities started on the 3rd with the fireworks display for a town near us. Last weekend at a neighbor's party fireworks were set off and Alyce had some major issues with them. With that in mind we were somewhat apprehensive on bringing her to this display. Apparently the proximity to the fireworks was what was causing her grief as she had no problem with this display. We set up our chairs at the back of our car with a view of the fireworks. Alyce had her little folding chair and we brought her tricycle too. In the end she ended up sitting in the stroller. The fireworks or as Alyce calls them "firetrucks" display was really top notch. There was a constant stream of detonations in a myriad of different colors. Alyce gave us a great play-by-play of what we saw. She would say all the colors that were up in the sky with the most memorable being her saying "rainbow colors" over and over again. 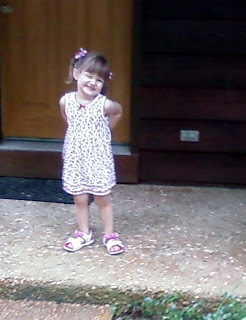 Alyce also had comments about the sounds of the fireworks by saying "big loud" and "big noisy". Lastly she separated each firework by its size. Describing them as "big one" or "baby one". We ended keeping Alyce up very late that night getting her to bed after 10:00. It was to our benefit though as she ended up sleeping in until after 9:30 the next morning. This played well into the 4th as she didn't need to take a nap. 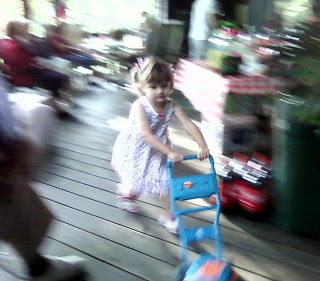 For the 4th the family journeyed to Uncle Eric's and Aunt Marilyn's house for their annual 4th of July party. Very surprisingly Alyce didn't exhibit any of her initial shyness. Usually she is quiet and hangs close to Mom or I, but today she left us pretty quick to go play with her cousin Andy. She spent a good portion of the evening away from Mom and I playing with the other kids in attendance and sitting in the laps of her grandparents and Aunts. When we were getting ready to leave after the fireworks display Alyce gave everyone a hug and kiss goodbye. We love it when she does that as it really showcases her personality and how much she enjoys seeing other people. As we were getting her into the car she said bye bye and waved to Uncle Eric's polar bear and Uncle Sam's dog Gunda. When we finally got home Alyce was a tuckered out little girl. I pulled her out of her carseat like a sack of potatoes and carried her upstairs and put her to bed. I enjoy seeing her so peaceful and content that she can change into her pjs, roll over, and fall right asleep. 0 comments on "4th of July"